Regular readers of this blog (and I am always amazed that there are so many of you) will know that I frequently drone on about what I have been up to and that most of it usually relates to history, with the occasional travelogue thrown in. Sometimes, and today is one of those days, I feel like writing something vaguely more meaningful. Yesterday, a popular TV programme revealed that a third of those questioned did not know who was on the British throne in 1859, more worryingly, a similar number couldn’t name the monarch in 1979! Admittedly the question was not straightforwardly phrased but even so…… Does this matter? Well, at the most basic level maybe not but it is symptomatic of our frenetic clawing towards the future and lust for something new, at the expense of our heritage. History is continually being squeezed from the school curriculum and what is taught is often disjointed and lacking in context. Yes there really is a whole load of history between the Tudors and the Victorians, of which many school children are blissfully unaware, even supposing they have grasped that the Tudors come first! And yes, history does extend beyond the twentieth century political history, so beloved of the examination syllabus. Tended to do better than other children when they faced challenges. Proved to be more resilient and able to moderate the effects of stress. Had a stronger sense of control over their lives. Believed that their family functioned successfully. Felt that they belonged to something larger than themselves. Recent studies by The Heritage Lottery Fund found that there are positive benefits to an awareness of heritage that relate to quality of life, community cohesion and creating better places to live. Can historians use their curiosity to change the world? I am an idealist, if we each change our little bit of the world, perhaps they can. History is about using the past to inform the present and the future. It can hone analytical skills and teach people to question but it can also engender a sense of belonging, to a family or a to community. An awareness of a shared past creates unity in the present. You may have spotted the history based quotes at the head and foot of most of the pages on my website. In the dim and distant past (well nine years ago), when I had a history classroom, most of these were depicted in coloured speech bubbles around the wall. Perhaps the most telling of these is George Santayana’s on the home page ‘Those who cannot remember the past are condemned to fulfil it’. Sadly many are not learning from the past and many never will but I for one have the vision to think we could try and encourage people not to repeat so many past mistakes. So yes, it matters but how do we spread the word? As my passion (far to far gone to call this merely a hobby) and what passes for my job overlap, I either work 150 hours a week, or I do nothing but enjoy myself! We can introduce others to history in a more moderate way. A bit like faith, we can take history out with us and introduce it to those with whom we come into contact. Not, I hasten to add, in a pushy overbearing way (that doesn’t work for religion either!) but gently, without people even realising that what they are doing is engaging in history. I have just written about this for the British Association for Local History’s newsletter. This blog post is already long enough, so I won’t repeat it all here now but there are many inventive ways in which this can be done; if you watch this space I may be inspired to feature some here. As many of you know, I am particularly focussed on engaging young people with history and heritage. Some of my descendants are on their way to visit (excited face) so I have the opportunity to put this into practice. Yes, I am talking about a fifteen month old and yes it is possible. I will show you the evidence next week. I know you will say ‘I don’t have the time’ or ‘My friends and neighbours don’t have the time’. Originally this post was entitled ‘Making Time for History and why this Matters’ but I have spent so long on why it matters that I haven’t made time to address how to make time in our busy lives. Another day, another blog post – I promise. It was a real pleasure to address the Isle of Wight Family History Society at their conference last week. 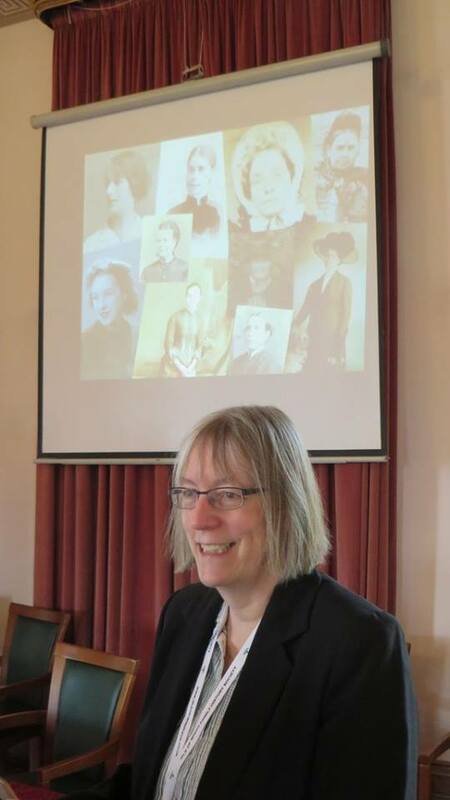 My topic was working women and I made sure I kept my own female ancestors in mind by including photographs of many of them at the start of my presentation. Get out there and trace your female ancestors, family historian friends. Ironically, I returned home from the island only to meet an IOWFHS member at my first talk back in Devon. In my absence, Buckland Brewer History Group entertained Torrington History Society in style, illustrating yet again what a wonderful, active, supportive group they are. Last week saw the publication of my article in Local History News (the magazine of the British Association for Local History) about involving the community in history. Then I wore several hats at the South West Area Group Family History Fair. There was plenty of positive response for the concept of One-Place Studies and it was another great opportunity to meet up with people. Mistress Agnes put in an appearance and there were several Swords and Spindles enquiries. We also enjoyed meeting several Braund Society members, so all in all, a good day. I now get two weekends at home! An interesting conversation between a fisherman of my acquaintance and someone trying to sell house and contents insurance, was recently put on speaker-phone for its entertainment value. Having given the usual name, address, age, number of rooms information, the next question related to property outside the home. You would think that the salesman, knowing he was interrogating someone of pensionable age, would have referred to barbeques or patio furniture but no. ‘Do you have a trampoline?’ he asks. Whilst the three eavesdroppers on this conversation are trying to un-see a vision of the potential customer on a trampoline, the discussion takes an even more bizarre turn. A grandfather clock is mentioned as an item that might need special listing. The salesman takes note and then asks, ‘Do you keep it in a safe?’ Well not currently. With very little turn around time since the Braund Reunion, we head off to the Isle of Wight with the caravan. We have a couple of deliveries to make on the way. The first is down a cul-de-sac. Our super new sat-nav is supposed to warn us when we head down roads from which, whilst towing a caravan, there is no return. It doesn’t. Chris manfully executes a 300 point turn in a space that would be tight for turning the car minus the caravan. A lady looks out of her door. She is probably worried that we will drive across her immaculate lawn. In self-defence she suggests that we use her drive and this helps us to effect an escape. Next we deliver a pastie. Not just any pastie, this is a super large Blackwells’ pastie. The recipient is not at home. We secrete it under a recycling box. We have made good time and arrive for the 6.00pm ferry before 4.00pm. Great news, there’s room on the 4.00pm ferry for us. The bad news is that it will cost an extra £21. This seems ridiculous so we decline. We are told to go away and come back after 5.00pm. We glance meaningfully at the near empty car park but no, it seems we must go and park elsewhere. Judicious questioning of staff members reveals that the 5.00pm ferry had been cancelled and therefore we could come back any time after 4.00pm. It is now 3.55pm but yes we have to leave and come back, which we do. ‘Are we booked in?’, asks the none-too-bright young lady. Her colleague has established not ten minutes earlier that we are indeed booked in but this young lady is struggling to find us on her data base. We provide our surname. ‘No’, she says. We aren’t booked. We spell the surname, more than once – still no. ‘What is the Christian name?’ ‘Chris’, we say – nope. She tries the surname again. ‘Is your name Mike?’ Well it wasn’t a minute ago so probably it still isn’t. ‘I have thirty seven people with your surname booked’, she says. She so doesn’t. We happen to know that there is only one person on the island with the surname and that they are very unlikely to have made thirty six bookings, to add to our one. We finally put an end to the farce by providing an address, which Miss none-too-bright can locate on her list and we head off for our two hour wait. 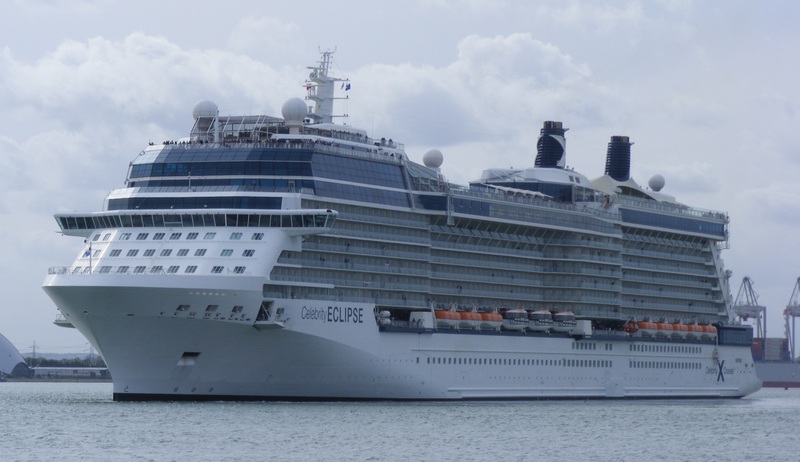 This is enlivened by the realisation that celebrity Eclipse, the cruise liner on which we shall be sailing in two months’ time, is in dock and just about to depart. Chris thinks we should take a photograph. This seems like a good idea but there are all sorts of notices, reading ‘no unauthorised access’, in the way. I am pretty sure that we are not authorised to access these areas and am mindful that taking photographs in dockyards is not always the way to make friends and influence people. Undaunted, I do manage to sneak a few pictures before my camera batteries sink into oblivion. Last week, a wonderful welcome from Chagford Local History Society and another lovely venue, Endacott House, in which to present seventeenth century social history. The next day saw me attempt to create a video with little notice and only myself to film, narrate and direct. It was supposed to illustrate our village and needed to show four locations in a minute. Lacking mobile phone or tablet, I was using my camera and I failed to work out how to pause the filming whilst moving from location to location. Running from place to place didn’t seem to work and I was hampered by the noises off of children playing and roadworks. Eventually I hit on the idea of creating a powerpoint using still photographs of the locations. Then ‘all’ I had to do was video the show. I couldn’t film the lap top because of the problems with reflection so I needed to project on to the wall (I don’t have a screen). This required me to hold the camera steady (steadyish) in my left hand, move on the slides using the remote control with my right hand and try to say something coherent with my mouth. This might’ve worked had I remembered to log out of Skype first. Sure enough, in my one minute of filming, up popped a message informing me that x had logged in to Skype. Take 2.……..
Then came the annual excitement that is the Braund family reunion. This involves plenty of eating and chatting, interspersed with visits to places of interest. I had to abandon re-uniting in order to take part in Plymouth Local Studies Day. Up with the lark, or at least up with the sparrows and starlings and off across Dartmoor to Plymouth. We have been instructed to park in a nearby library staff car park, which we locate without incident. Inevitably it is raining, I am in seventeenth century garb and we need to work out how to get from car park to venue. Fortunately we spot our good friend Maureen arriving in the car park; she will know the way. Chris is muttering ‘she’s changed her car’ but to me cars have four wheels and are pretty much of a muchness, so I wave enthusiastically. She waves back somewhat hesitantly. Even Chris is rushing to her car in order to present Maureen with a Guild of One-Name Studies bag that we had promised her. At this point we realise that this is not Maureen after all. A very appreciative audience for Mistress Agnes’ talk and plenty of books sold, then it is back to the car to catch up with the Braunds at Morwellham Quay. Unfortunately the car park we are in is locked during the day and no-one we ask seems to be able to release us. Chris is eyeing up a narrow gap between two bollards. The question is, is it wider than the car? (that would by my car). It seems that it is. A lovely, though slightly damp, day at Morwellham. We relive the lives of our ancestors by descending a copper mine, learning how to make rope and being educated in a Victorian schoolroom. The final day of our reunion sees us return to Poundstock Gildhouse for a Tudor Day. Dressed appropriately as sixteenth century peasants, we make bread and ginger beer and attempt drop spinning. I should be able to do this but I have to admit that I am pretty useless at it. Then we move up the social scale and are re-robed as gentry for lunch and dancing. The Braunds, most of whom are of retirement age, essaying a volta are a sight to behold. All agreed that it was our best outing yet.